I’m sure most of us ladies have done it. Whether we were late for work, moments from catching the bus, running from a creep, or just happily trotting between a fast walk and a skip. I lived in Manhattan for over 12 years and had my share of tipsy happy hour evenings where I stumbled to my cab in four in heels, but never in all those years of running in heels did I hurt myself. I move to Canada, I trade the heels for flats, and I break my foot. I’m still trying to decide if it was punishment for leaving the big apple or trading in my heels for flats. One raining evening I decided to kick it into a full sprint as I raced to ensure my sunroof was shut during a late summer down pour. Half way there I heard a loud crack. I looked back and to my surprise there was nothing I ran over. That’s when my foot gave out. I hopped back dreading the worst. a 12 hour visit to the ER sent me into cardiac arrest as the doctor diagnosed me with a French injury normally professional athletes get, the Lisfranc. I made him double-check the x-ray before casting up my foot and handing me the crutches. He recommended I see a surgeon immediately just in case I needed surgery. From everything I read and the pain I was in I knew this was not looking promising. Would I ever wear heels again? I could hardly walk, and gave up the crutches after one day of hobbling and almost falling down the stairs backwards. Instead I was couch bound in between crab crawling to the bathroom. All the internet forums stated Lisfranc injuries are not only rare, but can be life long lessons. If I needed surgery it would take six months to walk with a limp. Awesome I can scratch my surfing vacation good-bye in January. 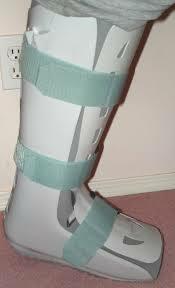 Luckily the surgeon diagnosed me with a foot sprain, and recommended resting my foot with an air cast for six weeks. In the mean time I RICED it. Rest, Ice, Compression, Elevation. While I don’t take medicine, I barely use Tylenol, I’m a true believer of all things natural. I began taking curcumin supplements daily to reduce the inflammation. Curcumin comes from the root of the Curcuma longa plant. Curcuminoids are classed as polyphenolic compounds — a type of substance known to have antioxidant properties. Antioxidants soak up harmful particles in the body called free radicals. These free radicals can attack cell membranes, causing weakness and inflammation over time. The University of Maryland Medical Center also points out that curcumin may stop inflammation by inhibiting the enzymes COX-2 and LOX, both of which appear to cause inflammation. Hopefully I’ll be trading in my robofoot for my heels soon. Word of advice, never run in flats. Next Next post: Best face bar ever!